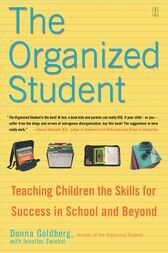 A must-read for parents, The Organized Student contains hands-on strategies for teaching your disorganized child how to organize for success in middle school and high school, with special tips for kids with ADD/ADHD and learning disorders. The overstuffed backpack, the missing homework, the unused planner, the test he didn’t know about. Sound familiar? When the disorganized child meets the departmentalized structure of middle school, everything can fall apart. Even the academically successful child will start to falter if she misses deadlines, loses textbooks, or can’t get to class on time. THE ORGANIZED STUDENT is the best! At last a book kids and parents can really USE. If your child--or you--suffer from the slings and arrows of outrageous disorganization, buy this book! The suggestions in here really work. Donna Goldberg founded the Organized Student, a consulting firm based in New York City, in 1990. Jennifer Zwiebel joined the Organized Student in 2002. Both authors live in New York City.